Dining Dish: Chefs and farmers compete - you eat and drink! This is the 4th year for the American Institute of Wine and Food (AIWF)Baltimore, MD Chapter’s culinary competition, Farm to Chef. Over 30 of Baltimore’s most talented chefs will partner with local farms to create innovative recipes for 300 plus food enthusiasts. It is the AIWF’s mission to advance the understanding, appreciation and quality of what we eat and drink. They are proud to present this one-of-a-kind event, designed to highlight the local talents of Maryland’s chefs and the bounty of our local farms. In addition to the chef creations, top mixologists from The Baltimore Bartenders Guild will serve innovative and unique libations using premium quality spirits from regional distilleries. Brendan Dorr, President of The Baltimore Bartenders Guild said, “The Baltimore Bartenders' Guild is excited to be part of the AIWF's Farm to Chef event. The bartenders of the BBG, like the chefs, will be using the freshest produce from the best local farms to create seasonally, exciting cocktails. 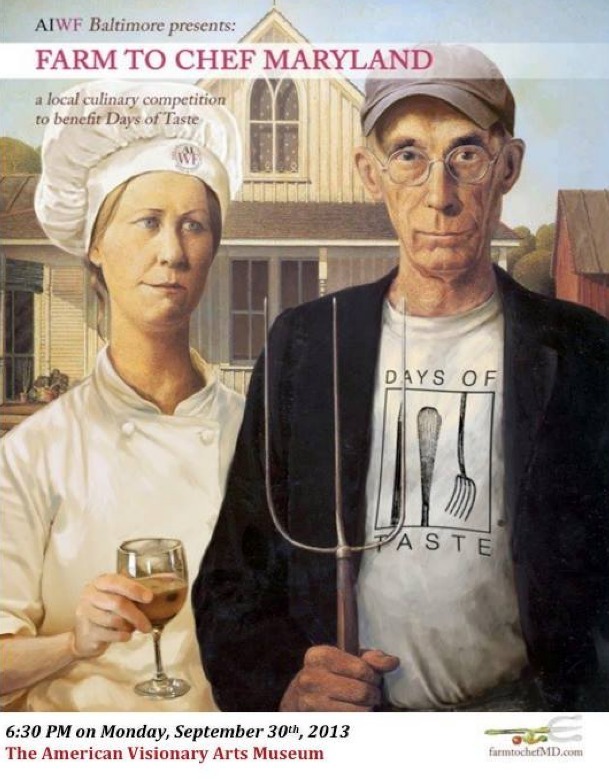 Check out all the chefs and farmers and get the details HERE.